Other efforts are underway for more elephants to be rescued and spend the rest of their lives in peace. 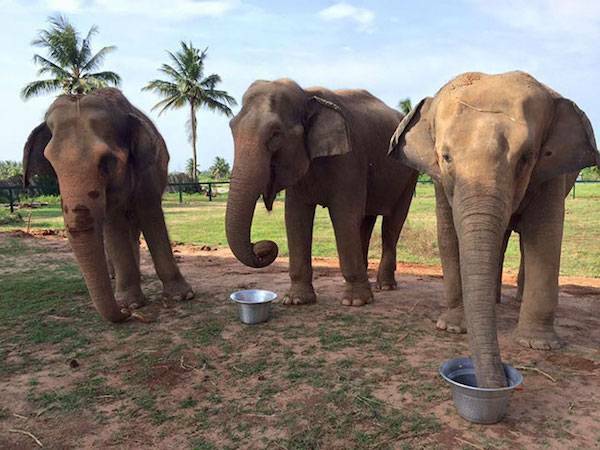 Sandhya; Indu and Jayanthi sisters enjoying an evening snack and their new chain-free life! The first three residents have arrived and are settling in. Welcome to Indu, Jayanthi and Sandhya (former temple elephants fondly referred to as the Kanchi Sisters) to the Elephant Care Facility in Markanam, Tamil Nadu (a joint venture of the Wildlife Rescue and Rehabilitation Centre, or WRRC, and Tree Foundation India) where they have had lots of fun exploring their new surroundings and their chain-free life! Other efforts are underway for more elephants to be rescued and spend the rest of their lives in peace. The more funds we can help raise, the more elephants can find happiness after a lifetime of cruelty. Please donate!